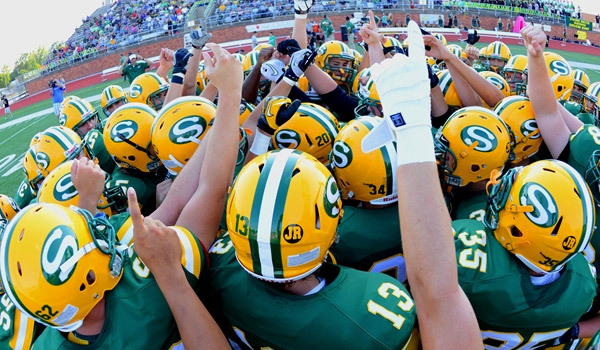 Week One of the 2013 Kansas high school football season is in the books and we are already seeing some movement in the Kpreps.com Top 5 rankings powered by Pinamonti Physical Therapy. Our Kpreps rankings are a collaborative effort from multiple media sources across the state and will be released each Monday throughout the season. �So let�s take a look at the Week Two rankings for each classification. Elsewhere in Class 5A, defending champion Bishop Carroll remains at No. 2 after handling Wichtia Heights 45-12. Blue Valley is up two spots to No. 3 after shutting out Gardner-Edgerton which was previously ranked in our 6A poll.� Emporia sits at No. 4, while Bishop Miege is ranked fifth.� Miege travels to take on Blue Valley this week. The Class 4A top five remained unchanged in the top four spots, but the Baldwin Bulldogs enter the poll at No. 5 this week.� Baldwin returns ten starters on both sides of the ball and should be a factor on the eastern half of 4A this season.� McPherson dropped out of the poll after struggling with El Dorado in a 27-13 win.� Top-ranked Holton posted a 20-point win over De Soto, while No. 2 Andale and No. 3 Eudora narrowly escaped upsets from Wichita Collegiate and KC Piper, respectively. The Class 3A poll remained unchanged as the top three teams posted easy victories.� No. 4 Garden Plain needed two fourth-quarter touchdowns to overtake Douglass 28-14, and No. 5 Sedgwick won a shootout over Olpe, 57-35. Centralia remains on top of the Class 2-1A poll after surviving a scare from St. Marys.� The Panthers prevailed 16-0 and will take on Riley County in Week Two.� Meade suffered a one-point loss to Holcomb for the second consecutive season.� The Buffaloes dropped from No. 2 to No. 4 this week, but the last two times Meade has lost a season opener, the Buffaloes have ended the season as 2-1A state champions.� Oakley takes Meade�s spot at No. 2 in the poll, followed by La Crosse at No. 3, and Lyndon rounding out the poll at No. 5. Top-ranked 8-Man teams Madison (8M-I) and Baileyville B&B (8M-II) played another classic in Week One.� Each team scored in the final minute of the fourth quarter, which ended in a 22-22 tie.� Baileyville B&B scored first in overtime, but could not convert the two-point try.� Madison scored on a Sage Blubaugh run and Dallas Thompson kicked the PAT through for the 29-28 win.� Both the Bulldogs and Falcons remain atop our polls in Division I and Division II, respectively. In Division II, No. 2 Thunder Ridge doubled up Mankato-Rock Hills 60-30, while No. 3 Hanover made quick work of Twin Valley League rival Linn.� Sharon Springs-Wallace County blanked Dighton 51-0 to remain at No. 4, and Victoria outscored Macksville 58-30 and rounds out the top five. Click the Rankings tab on the main page to view the Top 5 for each class.